Home > About Us > Call for Papers – 25th Anniversary Edition of the Asian American Policy Review! 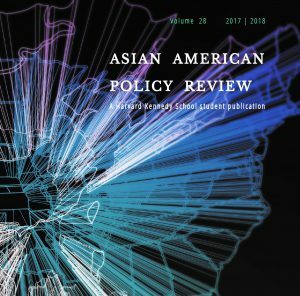 Call for Papers – 25th Anniversary Edition of the Asian American Policy Review! The Asian American Policy Review (AAPR) at Harvard University’s John F. Kennedy School of Government is now accepting submissions for its 25th anniversary edition, to be published in the spring of 2015. Founded in 1989, the AAPR is the first non-partisan academic journal in the country dedicated to analyzing public policy issues facing the Asian American and Pacific Islander (AAPI) community. We seek papers exploring 1) the social, economic and political factors impacting the AAPI community and 2) the role of AAPI individuals and communities in analyzing, shaping, and implementing public policy. We strongly encourage submissions from writers of all backgrounds, including scholars, policy makers, civil servants, advocates, and organizers. Media, Film, and Book Reviews should be 800 to 1,000 words in length. Abstracts for proposed pieces will also be accepted. Final acceptance will be based upon production of full paper. Please send all submissions to hksaapr@gmail.com. Please contact Daniel Lee (daniel_lee@hks16.harvard.edu) if you have any questions regarding submissions.